The chart above demonstrates the significant difference in long-term returns between large and small stocks. From 1928-2016, the S&P 500 compounded at +9.8% per year, while small cap stocks returned 12.2% annually, about 2.5% more. But including small cap stocks in your portfolio is about more than just higher returns. Small stocks improve overall diversification. Consider two difficult periods for US large cap stocks -- 1966 to 1982 and 2000 to 2010. In the first period, the S&P 500 grew at a reasonable +6.8% per year, but inflation increased at the same rate, meaning that stocks had a 0% "real" return for 17 years! Including small cap stocks in your portfolio would have helped. The DFA US Small Cap Index returned +12.8% per year, 6% annually more than large caps (and almost identical to their long-term average). In the second period, the S&P 500 barely produced any return -- earning just +0.4% per year. The DFA US Small Cap Index returned +10.6% annually. While this result was modestly below its long-term average, it was 10.2% per year better than the large cap index and would have provided a significant boost to a portfolio that was overweighted in big companies. But successful small cap investing requires a few important caveats; both demonstrated in the chart below. First, if you are relying on a "Total Stock Market Index" for your exposure to small cap stocks, believing you're getting additional diversification beyond an S&P 500 large cap index, you might want to reconsider. The chart above finds that from 1979-2017, the S&P 500 and the Russell 3000 "Total Market" Index grew in lockstep. There was no meaningful difference in short-term returns and no material difference in their long-term outcomes. Over this period, the S&P 500 compounded at +11.8% per year, and the Russell 3000 Index achieved the same +11.8% result. Second, if you're using a small cap index, you have to consider how well it targets those companies. A typical bogey for small cap stocks is the Russell 2000 Index (the smallest 2,000 stocks in the Russell 3000 Index). But the chart above shows its returns were also no better than the S&P 500 -- it slightly underperformed, returning +11.6%. The DFA US Small Cap Index, on the other hand, because it targeted smaller stocks more consistently and efficiently, did far better. 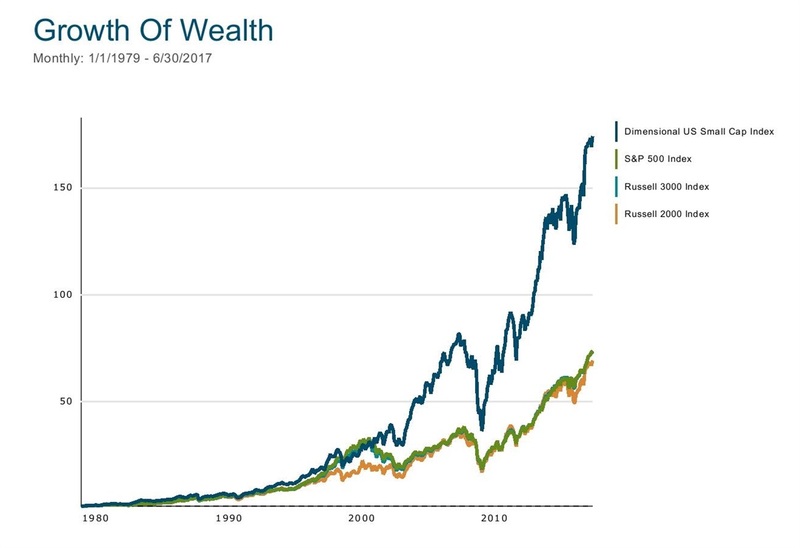 The +14.3% per year return was 2.7% annually better than the Russell 2000 Index and 2.5% annually better than the S&P 500. If that 2.5% sounds familiar, it should; it's the same spread we saw over the entire 1928-2016 period mentioned above. Clearly, big returns come in small packages. But you have to be careful with how you invest in small companies. Not all approaches yield the same expected results.